On a distant Caribbean island, corrupt local enforcers are kidnapping newly transferred US marines and using them to create a cult of genetically modified super ninja, masterminded by a textbook millionaire villain moonlighting in the drug trade. It’s a good job the new recruits to the island are Joe Armstrong (Dudikoff) and Curtis Jackson (James), hard-hitting army boys with PhDs in Pain and becoming slightly used to this kind of thing. The whole affair is a charade: comic-book action which retains a certain charm and good nature despite its B movie faults. 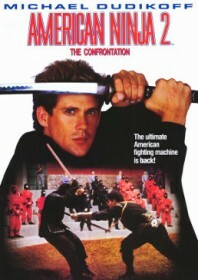 The returning duo work well: Dudikoff plays it straight and stern while James supplies the crucial comic relief.